UTair is a Russian based airline that offers an economy and business class cabin. Meals for economy class passengers are not included in the price of your ticket. However, water is still free. 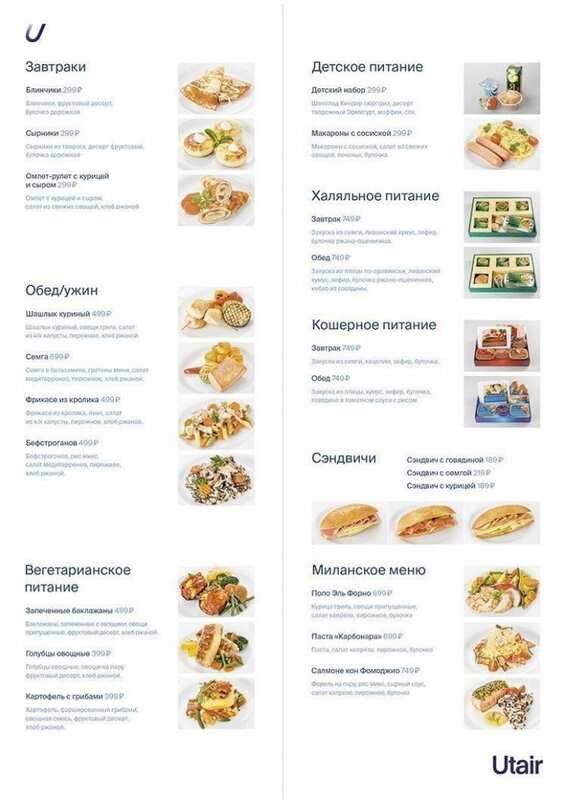 You can pre-order Utair meals from an extensive range of options that start from RUB189 (About USD$2.85), a menu of the pre-order meals is available below. If you decide not to pre-purchase meals, you can purchase items inflight, and that menu is also available below by clicking on it. You can pre-order breakfast or lunch options when booking your ticket, on the airline’s app or at travel agencies. 12 hours to order meals from Russia. 24 hours to order meals on flights to Russia. Lunch and dinner options include a hot meal, salad, drink and dessert, and the prices can be seen below. Halal and Kosher meals can be ordered too, but require 72 hours notice. Click on the menu below to view the entire buy on board range.